As with children, canine siblings can come with their fair share of problems—bickering and possessiveness among them. In dogs, since they can’t very well say “Get away! It’s mine!” this manifests itself as nipping and resource guarding. If allowed to continue, the behavior can escalate to more aggressive manifestations. I recently witnessed this behavior in a pair of dogs named Bam and Nina. When I arrived at the owner’s home for the in-home consultation, I could see they didn’t have an understanding of the boundaries the owner had tried to set. They met me at the door, jumping and nipping. Their level of excitement never ebbed, and I observed them fighting over toys and territory. At this point, I wouldn’t expect them to really harm one another or a human during their “play,” but if the behavior is allowed to continue and they aren’t given sufficient structure, a segue to aggression is a very real possibility. Luckily, the owners contacted Beltway Dog Training, and I was able to witness the dogs’ behavioral issues and give the owners my recommendation. They assured me they’re committed to doing what it takes, that they’re in it for the long haul, which is a necessity when getting a dog’s behavior back on track. We discussed crating. Controlling a dog’s roaming by placing them in a crate is not imprisonment (as long as they’re allowed time to be with the family during certain intervals); they learn to see the space as their den. Throw in a bed and a bone and they’re happy as can be. Controlling roaming also puts the owner in a position of authority—not to give them the option of being domineering, but so the dog learns to look to the owner for cues rather than only thinking about what they want. Putting siblings in separate crates gives them their own space so they’re less likely to fight over territory. Combined with a conscious effort to introduce consistent structure and avoid favoritism, crate training and additional basic obedience training is sure to improve Bam and Nina’s relationship and the relationship they have with their owner. 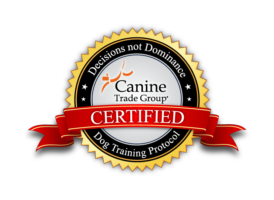 To see what kind of plan Beltway Dog Training can create for you and your dog, call us today at 202.318.1380.